A good 4K TV can take your viewing experience to another level. 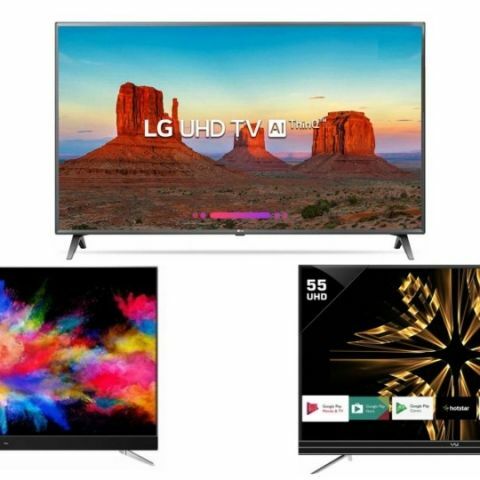 Today, we have put together a bunch of TV deals of Flipkart on brands like TCL, LG, Vu and more. Today, we have put together some of the best 4K TV deals that are currently available on Flipkart. The products in this list are from brands like Vu, TCL, LG and more. The Vu Official Android 4K LED Smart TV offers a resolution of 3840 x 2160 pixels with a panel size of 43-inches. The TV comes with a Vu Voice Active feature, which lets you search for your favorite content via voice search. As it is a Smart TV, users can also download apps like Netflix, Youtube, Hotstar and more. Click here to buy. If you’re looking for a bigger panel size then the Vu 55-inches Smart TV might fit the bill. The TV offers the same features as the 43-inch model, which we mentioned above. It has two HDMI ports, two USB ports, and one 3.5mm audio jack to connect a headphone or a speaker. Click here to buy. The Panasonic 43-inch UHD 4K LED TV available on Flipkart with a hefty 53 percent discount. The TV has three HDMI ports and two USB ports to connect external devices such as flash drives and game consoles. Click here to buy. The LG 43-inch UHD 4K LED Smart TV offers a resolution of 3840 x 2160 pixels. The TV lets you watch your photos and videos on a bigger screen with the Cloud Photos and Video app. Users can also download apps like Netflix, Hotstar, Voot and more. Click here to buy. The TCL Ultra HD 4K LED Smart TV offers a resolution of 3840 x 2160 pixels with a panel size of 55-inches. This Android TV allows you to access Google Play store and download apps like Netflix, Youtube, Voot, Hotstar and more. The TV is also equipped with a Harman Kardon speaker, which comes with a Dolby surround sound audio. It also has a voice search feature that lets you search for your content easily. Click here to buy.